Circular stitch marker, to mark beginning of each round. Each stripe is a little more than 3" (7.6 cm) long. Cast on 70 stitches in the Main Color [MC] (scarlet for Gryffindor, green for Slytherin, blue for Ravenclaw, black for Hufflepuff). Before joining the ring, slip the marker onto the needle. Knit in the round for 22 rows. After the 22 rows, tie the Contrast Color [CC] (gold for Gryffindor, grey for Slytherin & Ravenclaw (film), bronze for Ravenclaw (book), yellow for Hufflepuff) around the dark yarn on the inside of the tube, leaving a 2-inch (5.1 cm) tail of CC; trim the MC to have the same length tail. Now, knit 22 rows in the lighter yarn. Alternate knitting 22 rows of MC, then 22 rows of CC until you have knitted ten dark and nine light stripes. Weave the yarn tails from cast-on and cast-off into the scarf. Wash the scarf according to your yarn's instructions; dry it flat on the floor/table on top of towels. 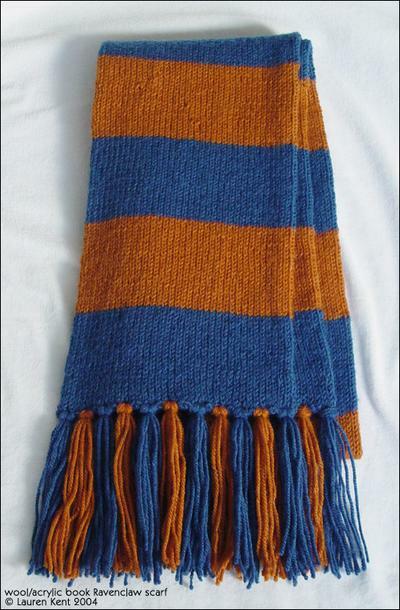 Be sure to align all the color changes along one side fold of the scarf (they're less noticeable that way). Block the scarf by stretching it width-wise until the entire thing is the same width. When the scarf is dry, it's time to add the fringe. I've found that the US hardcover of Sorcerer's Stone is a good size to measure fringe with - if you don't have a copy, use a piece of cardboard 7.5 inches wide. Just wrap the yarn around the book width-wise (y'know, the short way), then cut the wound yarn at the edge of the book/cardboard so it forms several individual pieces of yarn. To make one tassel, take 7 pieces of yarn and fold them in half together. Push the crochet hook through both thicknesses of scarf in the first row of knitting at one end, loop the folded ends of the yarn around the hook, and pull the yarn loops halfway through the scarf. Remove the hook, pass the cut yarn ends through the loop, and tighten the tassel. There are five light and six dark tassels evenly spaced on each end of the scarf; I usually do the middle light tassel first, then the dark end tassels, and eye the rest. Now, put on your scarf and show off! Lauren Kent's pattern was taken with permission from knit.atypically.net.